From the island of Sumatra, these Tigers are highly endangered with only 300-350 remaining in the wild, prominently due to habitat loss and poaching. These are the smallest Tiger sub-species, and webbing between their toes allows them to be competent swimmers unlike other big cat species. Sumatran Tigers commonly prey on larger ungulates, like Wild Boar, Malayan Tapir and Deer and sometimes also smaller animals, like Fowl, Monkeys, and Fish. 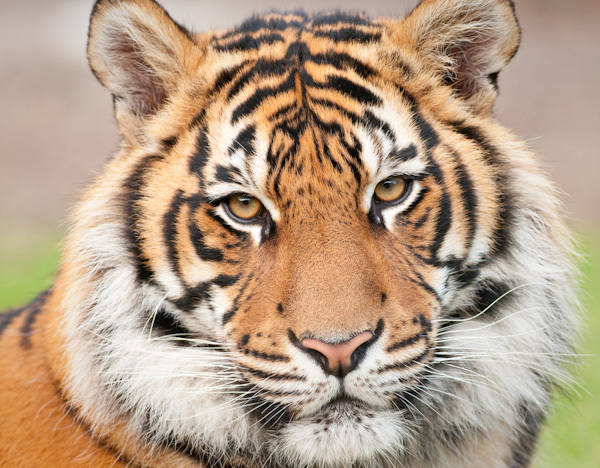 Deforestation resulting from the production of palm oil is a major threat to the Sumatran Tiger.